Summary: Finally getting some rain over the next several days thanks to a cold front. Cooler temps on the way! 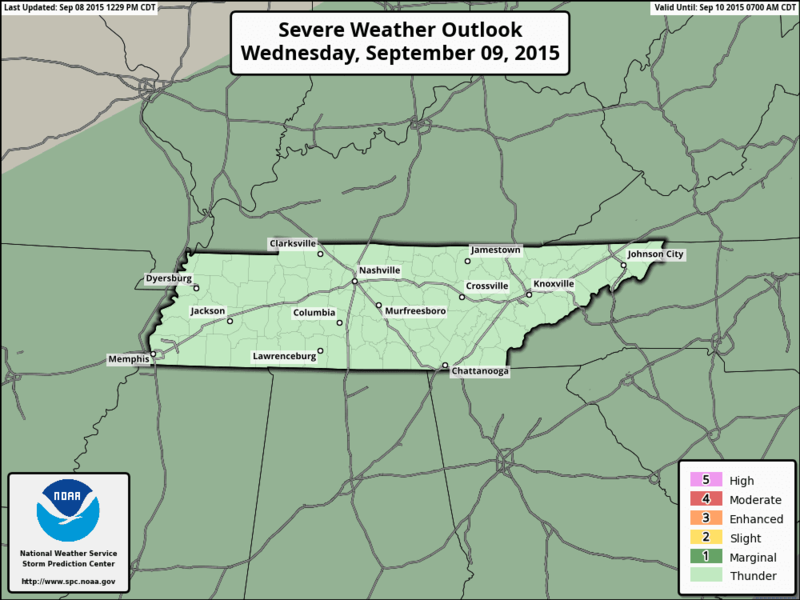 Post updated 9/9/2015 at 7:15am to include new graphics (there are notes where I edited things). Today was likely the last time we will see 90 degrees in the next week at least. By this coming weekend, we will get some teases of fall-like weather. 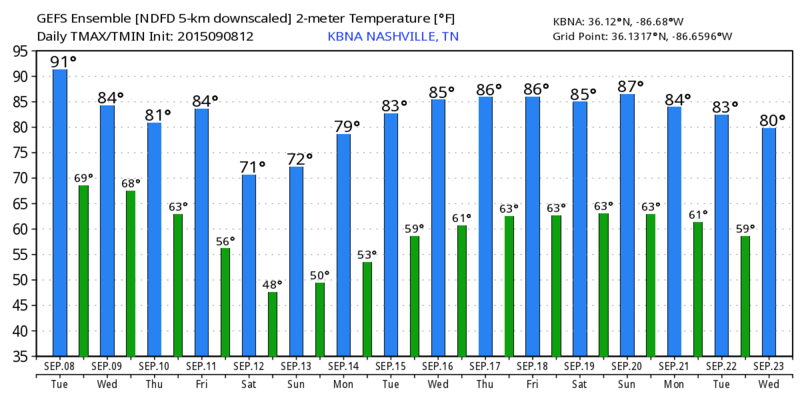 Here’s a nice bar graph predicting the temperatures for the Nashville area over the next 16 days. Look at those temps this weekend! 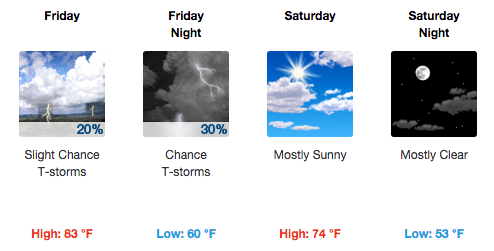 Saturday is shaping up to be a perfect day for all the events happening, including the Grinder’s Switch Music and Arts Festival in Centerville, Nature Fest in Fairview (Williamson County), and several neighborhood yard sales as well. So what about the rain this week? Wednesday is looking rather wet as we’ve been given a 50% chance of rain. A cold front will move through tomorrow bringing with it some thunderstorms. The high temperature for Wednesday should reach about 86 degrees. We are not outlooked for severe weather by The Storm Prediction Center, so we aren’t expecting a widespread severe weather event. The storms could be strong, with only a few getting strong enough to maybe warrant a warning. The SPC has us under a general thunderstorm outlook (a 0 on a 0-5 scale for severe weather). This could change as we get into Wednesday (and if it does I will update this graphic). Update 9/9/2015 – The outlook hasn’t changed, so while the graphic below is outdated, it’s still accurate. Keep in mind that these are models and the timing, location, and intensity of the storms can change. The morning on Wednesday will start of mostly dry with only a shower or two scattered about. 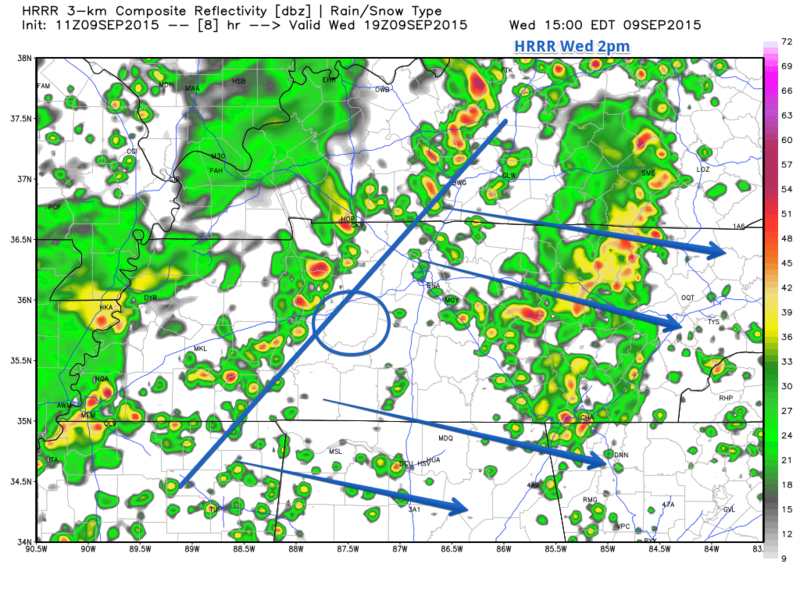 The current (8pm 9/8/2015) HRRR simulated radar shows Wednesday morning mostly dry for Hickman County. 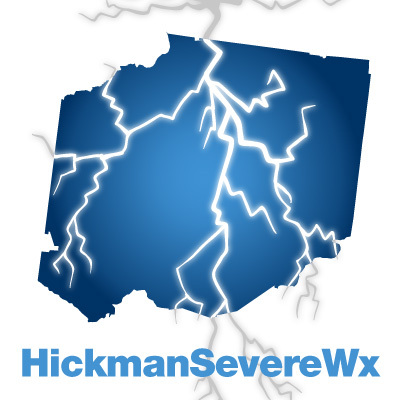 (I will update this HRRR loop in the morning as well I’ve updated the HRRR loop below. Current as of 9/9/2015 7:00am). The HRRR loop above only goes to 10am Wednesday morning 8pm Wednesday night, but you can see the line of showers off to the west that will make Wednesday afternoon wet for us. 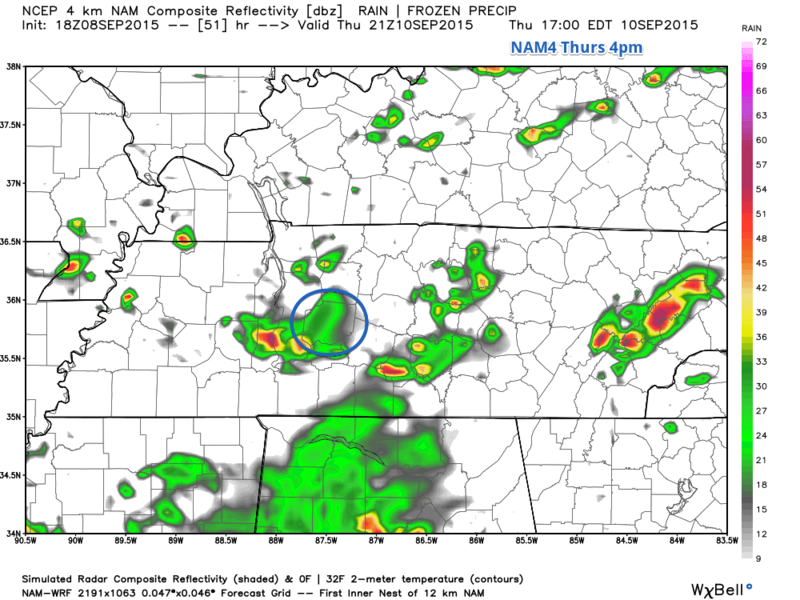 NAM4 is where we look once the HRRR model is out of range. Here’s the simulated radar from NAM4 at 12pm Wednesday, showing the line of showers and storms off to our west slightly weakening as they move into Tennessee. Update 9/9/2015 7:15am – HRRR is now in range and shows us mostly dry until around 1pm, where showers start to pop up. Once the rain starts moving closer, a line of thunderstorms starts to form in the afternoon hours. Here’s NAM4’s simulated radar for 4pm Wednesday. Here’s HRRR’s simulated radar for 2pm, showing this line of thunderstorms. You can see the line of storms developing between the red lines I’ve drawn as it marches off toward the east southeast that I’ve marked in blue arrows. We will start to experience the storms between 5pm and 8pm. NAM4’s simulated radar shows the line of storms (red line) at 7pm. 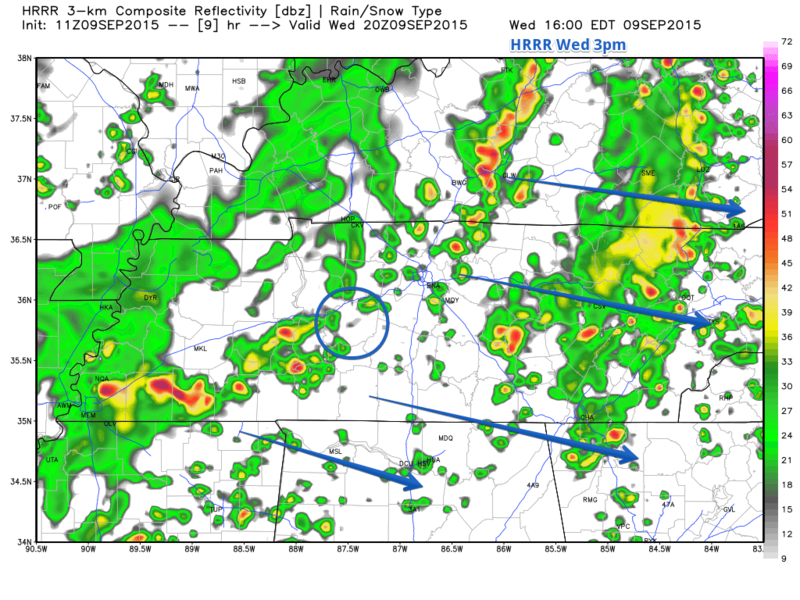 Update 9/9/2015: The HRRR is now showing the storms not so bad at all compared to the NAM4 last night. 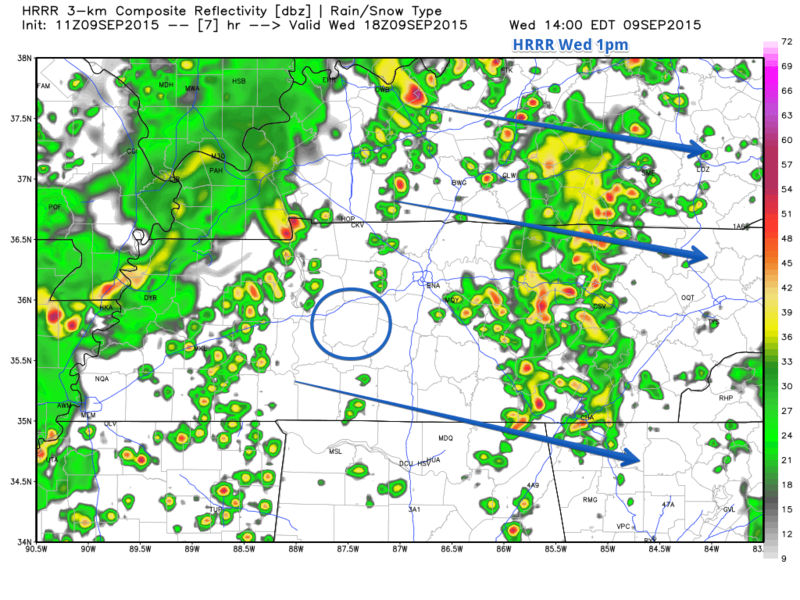 Below is the HRRR at 4pm. As we start heading to bed Wednesday night, storms will linger a bit as the line moves through and some storms come up from the south a bit (according to NAM4). Here’s NAM4’s HRRR’s simulated radar showing the main line of storms moving off to the east, but some storms could come up from the southwest (red arrow). Overall, the storms will start dying down as they move through the area. Update 9/9/2015 7:15am with HRRR graphic. Here’s the NAM4 simulated radar for Thursday 1am, showing the rain and storms dissipating as we are sleeping. 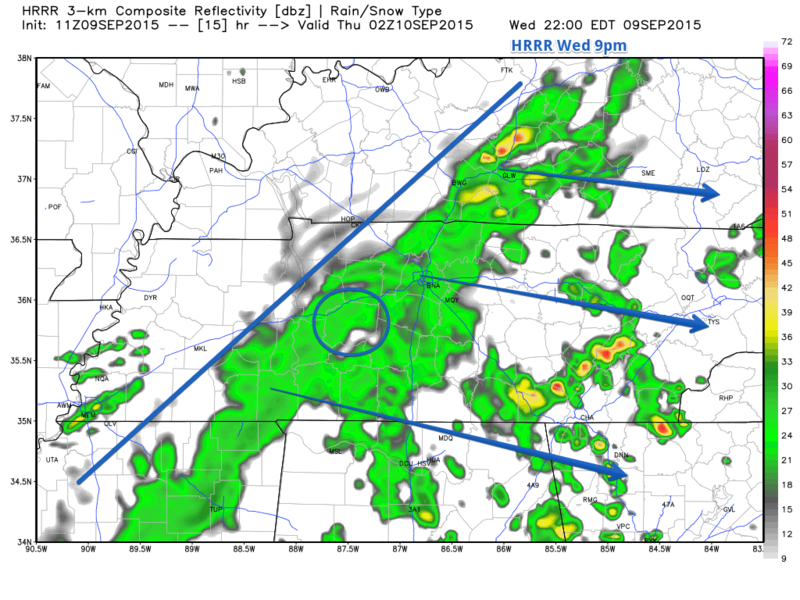 Update 9/9/2015 7:15am – The HRRR is showing the rain should push out by late evening Wednesday. Updated graphic below. We will see more storm changes on Thursday as our high temperature reaches 81 degrees with a 60% chance of rain. Here’s NAM4’s simulated radar for 4pm Thursday, when it thinks we will see some storms. As we move into Friday, we will see a 20% chance of rain as this rain system moves out and brings with it some nice refreshing cooler air. This cooler air will help bring our high temps to about 71 and 72 degrees for Saturday and Sunday, making it a great weekend to be outdoors for the different festivals and other outdoor events taken place.